A local doctor helped save a woman battling breast cancer from additional pain and suffering after performing a procedure she just brought to the CSRA. While we don’t typically connect the arm with breast cancer, one oncologist says you should. “I feel like I got another chance at life,” sale Dale Boyce, a 45-year-old mother who beat the odds just a few months after developing stage three breast cancer. Boyce was at work in Williston, South Carolina when she thought her time ran out. “I got sick and I started bleeding from the breast. I called 911 and they came on to Subway. I was taken to Aiken Regional,” she recalled. From Aiken Regional, she went to the Georgia Cancer Center where she met breast surgical oncologist, Dr. Alicia Vinyard. 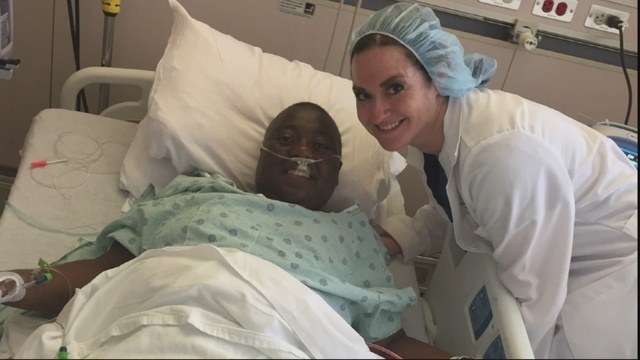 It was during that surgery that Dr. Vinyard performed another procedure to prevent Boyce from getting what’s called a lymphedema, when breast cancer has invaded the lymph nodes under the arm. Dr. Vinyard says lymphedema causes arm swelling, pain, immobility and chronic infections. About 25 to 30 percent of breast cancer patients develop it, especially those with a higher BMI. But Boyce avoided it with the new procedure Dr. Vinyard brought to the Georgia Cancer Center. “[With] Some women, the lymphedema is so significant the entire arm is swollen. They have to wear a compression sleeve, not just when they’re on an airplane, but 24/7. If they don’t wear the sleeve, their arm is significantly bigger, it’s heavy, it’s painful. They can’t do exercises. They can’t do anything for themselves. It can cause disability,” Dr. Vinyard said. Boyce avoided that trauma. And wants other to do that same. Boyce said she has to complete radiation for the next few months, but she is now cancer free. Doctor Vinyard said the procedure prevents lymphedema by 87 percent.